Robin Wright hit the red carpet this evening(May 17th) in Cannes, France for the 70th Cannes Film Festival for the opening ceremony and the 'Ismael's Ghosts' premiere at Palais des Festivals. 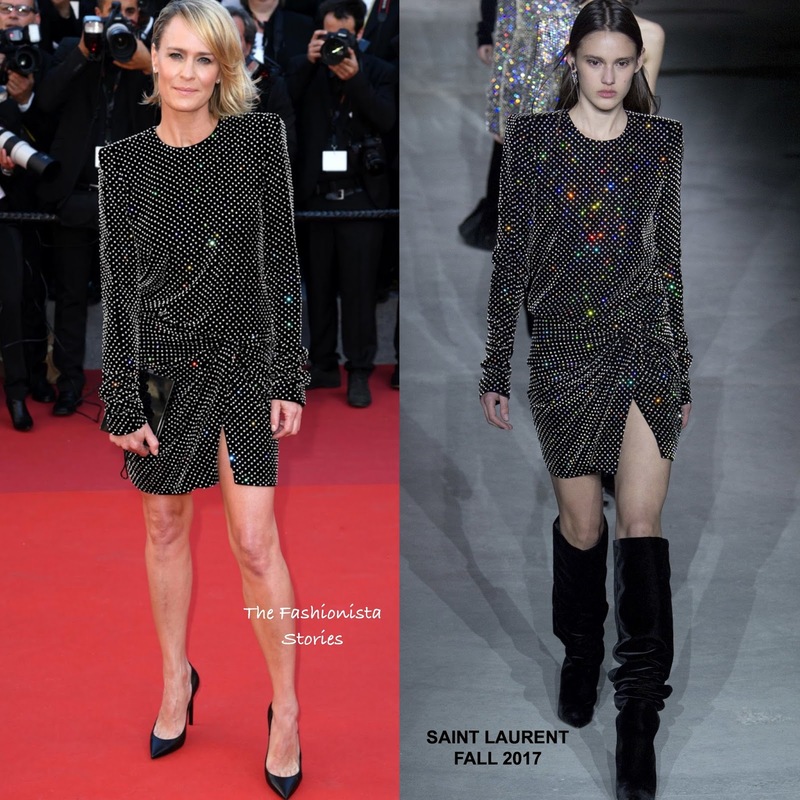 Robin ditched wearing a floor length dress or gown for a SAINT LAURENT FALL 2017 black long sleeve beaded swarovski beaded mini dress with padded shoulders, a gathered skirt and short slit. For me, to be clear, this is such a cute dress & she looked great even though this is not the traditional Cannes opening dress that we are use to seeing. It would also be great for a regular premiere and the black pumps were a safe choice. What do you think of Robin's sparkly look? I disagree. As always is necessary to give a look at the context of why the star is walking a red carpet. Robin is a high acclaimed actress who was invited to the opening night because she will be premiering a short film as a director during the festival. She's not premiering any films on the opening night, so it's not "her" night. Showing up in a gown would have been extra, and giving that she's famously red carpet-allergic, I have no doubt that it wants even in her mind. She's not one of the "yacht girls" screaming for attention, or other celebrities who walk the red carpet just for show. She was there for work. Also consider that she was a juror a few years back and in that occasion she did the gown thing as required.